Khirallah PLLC is an experienced Law Firm that has the effectiveness and efficiency to successfully assist clients in resolving real estate and construction-related disputes, including wrongful foreclosures. The firm’s goals are simple: assertive representation, innovative approaches, and successful results. 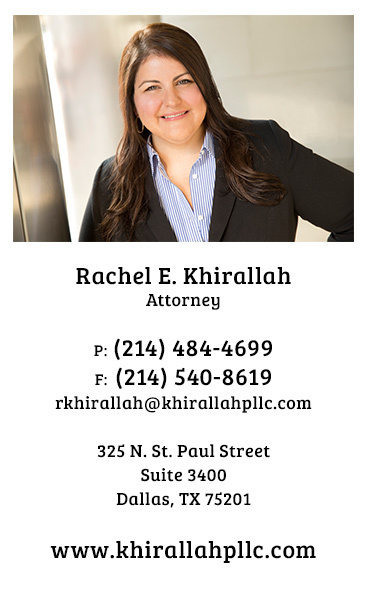 Ms. Khirallah regularly represents individuals and businesses in foreclosures and replevins, wrongful foreclosures, mortgage fraud, Deceptive Trade Practice Act violations, mechanic and materialmen’s liens, landlord/tenant disputes, and owner financing transactions. Her experience and commitment enables her to represent clients in virtually any type of real estate transaction or construction dispute. She is committed to providing legal solutions that make sense and are customized to client needs and goals. Most disputes get resolved through negotiations or mediations; therefore, having a lawyer with the knowledge and experience necessary to counsel clients on risks and to seek resolutions that avoid costly litigation is extremely important. Ms. Khirallah is also an experienced trial attorney, and, if necessary, she will aggressively pursue clients’ rights in both state and federal court. While no lawyer can guarantee success, having a lawyer who has experience in both negotiating settlements and seeing a case all the way though to trial greatly improves the prospects of achieving the best possible outcome. Settlements are not always possible and litigation is not always the answer, but you can be assured from the moment Ms. Khirallah is hired, she analyzes the core of the dispute to determine how to proceed in the most efficient and effective manner for her clients.